Just another football fan with Internet access, right? There are times when people marvel at Sir Alex Ferguson’s ability to keep up with modern football. His managerial career spans almost four decades, during which time the game has undergone radical changes both on and off the pitch. At Manchester United’s end of season awards ceremony in May, he described himself as “a dinosaur”. This hasn’t stopped him from racking up countless trophies over the years, nor has it stopped him from dealing with many tricky off pitch situations. Yet there are times – not too many it must be said – where it becomes obvious he is a man from a different era. His criticism of defender Rio Ferdinand over his refusal to wear the Kick It Out T-shirt before the game against Stoke City provides one such example. Ferguson, renowned for very rarely criticising his own players, said Ferdinand had let the club down and would be “dealt with” (a phrase which can sound menacing enough from most managers, let alone from the game’s biggest disciplinarian). He also stated that he had been left embarrassed by Ferdinand’s actions, having told journalists on Friday that everybody should and would be wearing the T-shirts prior to the game. With all due respect to Sir Alex, this really isn’t about him. Rio’s brother Anton was the victim of racial abuse in one of football’s highest profile sagas. The family suffered an immense strain, including Anton being sent bullets and death threats. Rio’s international career effectively came to an end over the situation (despite Roy Hodgson’s claims to the contrary), while the perpetrator John Terry received a mere four match ban, with a £220,000 fine on top. 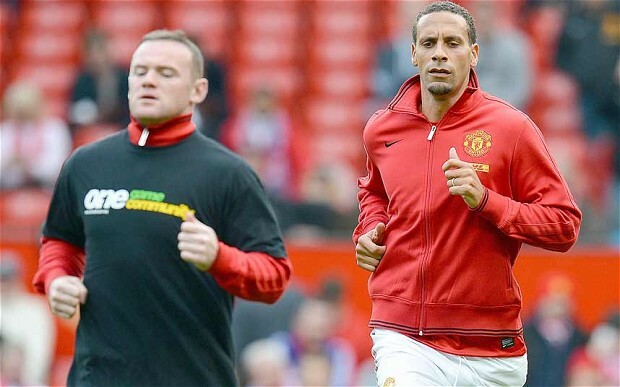 Making a stand: Ferdinand’s decision to not wear an anti-racism T-shirt angered his manager. All rights to this photo are reserved by Getty Images. If Ferdinand feels that Kick it Out are not doing enough to stamp out racism, he is under no obligation to wear a T-shirt with their message on it (incidentally, as Gary Lineker pointed out on Match Of The Day, not wearing it actually creates more awareness of the issue). As much as Sir Alex likes to have the final word over what his players do, his attempt to punish Ferdinand will be seen as crass and damaging. His comments about Reading striker Jason Roberts, who led the calls for the boycott, were greeted with much dismay. In particular, his opinion that “there shouldn’t be sheep wandering off” smacked of someone who may have meant well but went about things in the wrong way. Does he think that players should be like sheep and blindly follow the crowd? Should they not be allowed to have their own opinions, particularly if they are in the group of players who are most affected by the issue of racism? A couple of other things to note. Firstly, Ferdinand was not the only player to boycott the T-shirts. Aside from his brother Anton and Roberts, Manchester City duo Micah Richards and Joleon Lescott took the same option – Lescott has been doing so since 2007, after witnessing Newcastle player Emre allegedly racially abuse his former Everton colleague Joseph Yobo and receive no FA punishment. Another Reading player, Gareth McCleary, Stoke’s Kenwyne Jones, QPR’s Shaun Wright-Phillips and Junior Hoilett, and Everton’s Sylvain Distin and Victor Anichebe were also seen without the T-shirts. The key thing to note is that NONE of these players had to suffer the indignity of their managers publicly rebuking them for it. Stoke manager Tony Pulis stated that players had “the right to say yes or no”, whilst Reading’s Brian McDermott said he respected the views of his players and gave them his “100%” backing. Secondly, and something that many people seem to have forgotten, is that there are United players past and present with previous for this. Back in 2005, when a Stand Up Speak Out anti-racism campaign had been launched, Gary Neville, Paul Scholes, Roy Carroll and Roy Keane refused to wear the tracksuits (Neville had earlier spoken about Nike cheapening the campaign by looking for a commercial advantage). For some reason, I can’t recall there being a similar backlash. Much as Kenny Dalglish received huge criticism for his public behaviour during the Luis Suarez affair, Ferguson will receive the same bad press, and rightly so. While Dalglish was misguidedly trying to defend his own player, Ferguson has done the exact opposite, creating an image of potential disharmony in the camp. Some years ago, he featured in a documentary. One part of it can be seen on the following link . If you fast forward to 4.15, you will see him talking about his first manager at Rangers – Scot Symon, somebody Ferguson had huge respect for. Ferguson then goes on to say that there was one thing he took from him above anything else…..the art of never criticising his players in public. This entry was posted in Manchester United, Premier League and tagged Anton Ferdinand, John Terry, Kick It Out, Manchester United, Racism, Rio Ferdinand, Sir Alex Ferguson. Bookmark the permalink. ← Roy Hodgson and 4-4-2: Will England boss break the habit of a lifetime? Abramovich’s gamble set to backfire – for once. Roy Hodgson and 4-4-2: Will England boss break the habit of a lifetime? Wayne Rooney’s Injury: Temporary Pain Relief for Sir Alex’s Headache?